Middle TN Selfie is perfect at any party or special event. The Middle TN Selfie Booth is a hit at all types of parties and events. 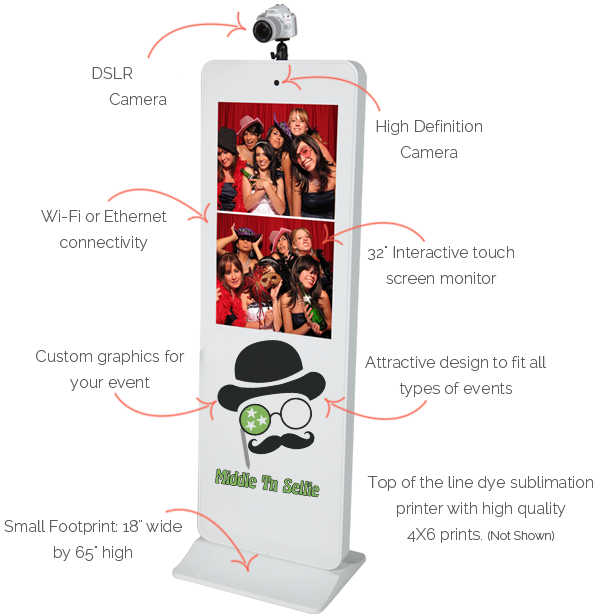 This photo booth will provide hours of entertainment and draw guests in for a fun time! Our modern, open air design allows as many people to be in the photo as you want. No more cramming into a small photo booth. The sleek, interactive, 32-inch touchscreen display will draw your guests in, keep them entertained, and leave them with a fun lasting memory. This screen technology allows your guests to pose, snap, and share their photos instantly via social media, text and email as well as print quality photos in just seconds! Add a customized photo frame or backdrop to fuse your brand instantly with the fun! It’s all the fun of a photo booth… without the booth!